I had one of those great twitter moments yesterday, completely by generosity of tweeps. This captures one aspect of why I introduce twitter to our preservice teachers in hopes that they will either enter in or give it a go later. My summer intermediate algebra class is leisurely (12 weeks instead of 6) picking its way through the summer. Linear, quadratics, exponentials with tons of technology use, simulation and experiment and a dash of art. And then comes logarithms. My emphasis on introduction is as a way to undo exponentiation. Not a big emphasis on inverse functions, because though we're using the language, we haven't really dove into function language yet. But doing and undoing we talk about a lot. But after that reasonably good start, we come up against the log rules. Our introduction was Kate Nowak's log law introduction (which I found through Sam Shah's Virtual Filing Cabinet; why bookmark? Let Sam do it for you.) The idea is that you see lots of examples and then try to generalize into a pattern, which is the log law. Nice pedagogy! Yesterdays lesson included connecting the exponent rules to the log laws. Wasn't expecting any real response. But then, the great feedback and constructive suggestions began immediately. This is where we should start. We - as a teaching culture - are so steeped in general then specific, abstract before concrete, that this is a good first check. They did understand the multiplication to addition rule better. Look for areas where students understand and build off of those. Connections strengthen learning. This is the connection I'm going to follow up on. Look for a way to get it across. Think about the broader context. How the logarithm lives as an inverse function, with a nice concrete place to start. Support that this is challenging, and not me just being stupid. Of course, I'm happy when people point out I'm just being stupid, too, since I don't want to be stupid. Neat post. It gives a lot of good thinking about introducing logs, being intentional, and paying attention to students making sense of notation. This is very close to how I introduce logs, and how it looks like Kate Nowak introduces them, too. I use to think this was inappropriate for high school but okay for college (because of their bad early experiences), but I'm beginning to think that's how we should handle bad math notation. Use constructive notation and then transition the students to traditional. I don't think this is accessible (YET), but I'm going to mention this, too. Part of the class is getting the students more comfortable with symbolic methods, and I like how this emphasizes the operational part of logarithms. A reminder of where to start. This is the fundamental relationship for logarithms, and connecting back to it well and often is important for learning in both directions. So then 2v2^3=3. As it should be. I'm kind of joking? Anyway, excellent teaching advice. I am so glad to be connected to these excellent teachers. And even though I can't go to Twitter Math Camp, I still get to have the home game to play. Why don't you play along? http://oldmathdognewtricks.blogspot.com/2012/05/my-version-of-log-wars.html My version of Kate's log wars. It also mentions Amy Gruen's Loop for Logs post that I used. Thanks for the plug for TMC. Wish you could make it. We'll let you know what we decide for next year. 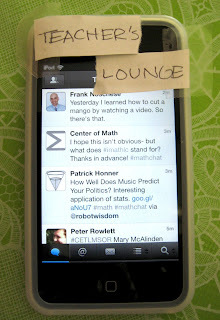 Oh - and I *love* the picture of the faculty lounge! I think a lot of the problem is that most people are not able to compute or estimate log values mentally, so there really is no such thing as a concrete example for most people. It is like trying to explain why a + b + c is a + c + b using arithmetic axioms to a student that doesn't know how to add numbers. If you deal in base 10 with integers greater than 0, then the log value is roughly the number of digits. You can make sense of the log rules using mental math with the number of digits approximation (cubing a number results in roughly 3 times as many digits, etc).